The Port Manager, Onne, Mr Durowaiye Ayodele has commended the involvement of the Nigerian Navy in commercial shipping, saying it has brought stability to the nation`s maritime environment. This was contained in a statement in Lagos by Capt. Iheanacho Ebubeogu, the General Manager, Public Affairs of the Nigerian Ports Authority(NPA). 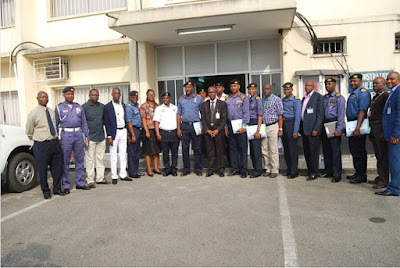 The Port Manager gave the commendation when students of Senior Course 38/2015, Department of Warfare, Armed Forces Command and Staff College, Jaji visited the Onne Port Complex, as part of the annual exposure to areas of strategic interest. He said that the relative peace enjoyed in the Niger Delta region had rubbed off positively on shipping, and attributed same to the cordial relationship between the NPA and the Nigerian Navy. The Port Manager also said that the operations of Nigerian Liquefied Natural Gas (NLNG) could only be guaranteed in an environment of peace, noting that these were very strategic assets for the nation’s economy. He disclosed that among other things, the NPA in a deliberate effort procured fast moving security boats for the Navy as Management’s commitment to support its surveillance of the nation’s territorial waters. He assured that the NPA management would continue to work with the Navy in the interest of the national economic development. The Port Manager stated that the newly constituted Port Security Committee had provided an avenue for stakeholders to share information on security challenges unique to the port and to jointly proffer solution to such challenges. In a vote of thanks on behalf of the Commandant, Lt. Cdr NB Karah, expressed satisfaction with the enlightenment and assured that the knowledge gained would be applied in the college and for future endeavors.